FC Copenhagen's rise & domestic dominance has been down to a number of different factors & it could be argued, it's benefiting Danish football as a whole. Stuart Fuller explains. Imagine a league where one team dominates the domestic game so much that the league title is over before the end of October. Imagine a situation where that team will simply get stronger and stronger year after year with the almost unlimited cash coming their way from the Champions League campaigns. With that cash they can Hoover up the best young talent in the league, almost to the point of stopping anyone else getting their hands on them. You don't have to imagine too hard because this is exactly the situation that has now arisen in Denmark. The Champions League draw on Friday saw Premier League double winners Chelsea being drawn against FC Copenhagen. The immediate reaction from the press in the UK was "That was the draw that everyone wanted". Why? Is this the simple uneducated view on football in Europe? Certainly few who had followed the SAS Superliga in the past few seasons would dare mutter such words. 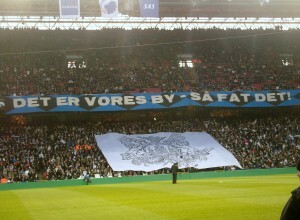 In the past few seasons FCK have dominated the game in Denmark, winning the league with increasing ease. Last season's 9 point margin was the biggest for some years, but this season they have surpassed even the most skeptical observer’s expectations. Halfway through the domestic season the club remain unbeaten and hold a lead of 19 points from 19 games. They have a goal difference of +35 and have beaten the second place team Odense BK home and away, scoring 8 goals in the process. So have they just got better or have the rest got worse? One of the reasons for the success has been the way that the club has been structured. The on field activities are kept very distinct to the business side of affairs, which has meant that they have avoided some of the issues that have blighted the last few seasons at rivals Brondby IF who due to their public listing as a company more often than not have to wash their dirty linen in public. Continuity has also been important in terms of the team management with coach Solbakken being allowed time and resources to shape a squad capable of initially dominating the domestic game, but now being able to hold their own in Europe. When the draw was made for the Champions League few outside Copenhagen expected FCK to finish as runners up. The group would be dominated by Barcelona, but with Rubin Kazan coming to the end of their season and thus match fit, and Panathinaikos investing in their squad to retain a domestic title they have not won for 6 seasons FCK were deemed to be also-rans before a ball was kicked. It should be noted that this was the only group of the 8 that included 4 domestic champions - in the Champions League who would have thought it - but strong performances at home, including a well deserved draw with Barcelona in a jammed-packed Parken saw them through, which of course is bad news for the other 11 clubs in the SAS Superliga as the additional revenue from a further 2 games will be in part be invested back in the already strong squad. The cash from the Group Stages will almost certainly be put to good effect in the January transfer window. The club will want to move heaven and earth to hold onto Dame N'Doye who has been so impressive in the first half of the season, and the main reason why Solbakken has not been tempted to purchase a target man. They may also face pressure from suitors of players such as Oscar Wendt and William Kvist but at some point they will have to look for a replacement for Jesper Grønkjaer. Kvist is an interesting player, and his importance to the side cannot be underestimated. He has employed a personal coach for many seasons to improve his mental conditioning, realizing that it is not only about the physical side of the game. For years he was seen as a player who could play in most positions but this season he has made the central midfield role his own. Such adaptability will no doubt flag on the radars of a number of English sides before long, although with the club in such rude health at the moment they can now afford to say no to some of the offers they will receive. FCK will go into the game against Chelsea at the end of February not having played a competitive game for nearly 3 months. Plans are already in place for a series of warm up games in hotter climates during January but nothing can prepare them for the challenge than the cut and thrust of domestic football and that may be their undoing. So what do the Danish footballing public make of the dominance? Some commentators point to the fact that the club were manufactured for success less than 20 years ago and essentially given Parken, the national stadium, as their home ground. But trying to fill one of the biggest stadiums in Scandinavia every 2 weeks is going to be tough. 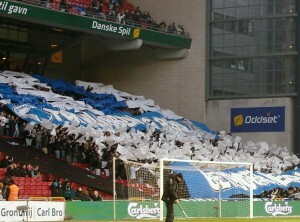 Few teams come to Parken expecting to get even a point and thus away fans tend to be in the 100’s, rather than the 1000’s. Ticket prices are reasonable compared to the situation here in England, but with virtually every game shown live on TV the public tend to stay at home. It was inevitable that demand for tickets for the game versus Barcelona would far outstrip supply, and so the club sold the 3 games as a package, ensuring that they secured both decent gate receipts plus a good home atmosphere. So far we haven't seen teams purposely field weakened teams against FCK, but I am sure it will happen in the second half of the season. With second place this season going into the Champions League qualifying rounds next year, the focus will shift from trying to beat FCK to trying to get one over on the nearest challengers, more than likely to be Odense BK with Roy Carroll still performing miracles between the sticks, FC Midtjylland or Brondby IF. Certainly these are the 3 that will look at targeting FCK next season after Solbakken has moved onto the Norwegian coaches role he takes up in June and the inevitable exodus of players in the summer. "This evokes one of the great cyclical arguments in football. Do we want quality in our leagues, or just good competition? In Sweden, for example, the Allsvenskan trophy has racked up more miles than Marcus Bent in recent years, but the standard of football is far lower than in Norway or Denmark, where Rosenborg and FCK make the domestic title grimly predictable year after year. The good news for Denmark is that FCK’s exploits have nudged the league far enough up the UEFA coefficients to earn a second Champions League place for next season – so while the title may be all but settled, a tangible reward makes the race for second place a little more compelling." Stuart is a well respected author and well travelled football fan. You can read more from him at the truly wonderful The ball is round.